An Answer to the Magic Springs Question? It's Frenzy Friday at Conneaut Lake! Aerial Antics a la Idlewild! 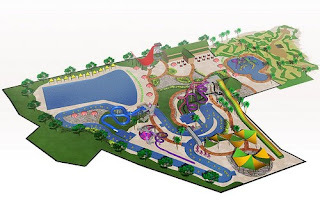 Adventure Park USA in New Market, Maryland has officially announced the addition of a 5.5-acre water park for the 2010 season. Construction will be completed in two phases. The first phase will consist of a 20,000 square foot wave pool, an interactive water play structure, and a 1500 square foot "Kiddy Spray" area. The second phase will incorporate a quarter mile long lazy river and slide towers. On an interesting note, park owner Larry Stottlemyer has stated in the past that he hopes to raise the majority of the funds required to complete the project through special multi-year pass sales. Additional renderings as well as information on these unique passes can be found on the park's web site. Instead of counting down the number of days left in summer, how about counting down to something a little more pleasant? Southern California's famed Santa Monica Pier is gearing up to celebrate its 100th anniversary on September 9, 2009. The occasion will be marked by many festivities, including a ceremonial cake cutting by a group of centenarians and the pier's first large-scale fireworks display in 18 years. On a coast once dotted with amusement piers, Santa Monica's Pacific Park now stands as the last relic of a bygone golden age. The Santa Monica Pier Restoration Corporation hopes to draw upon this rich history to create an even brighter future. You can read more about the planned centennial festivities in the Los Angeles Times as well as on the pier's own centennial web page. Back on the East Coast, Anthony Raffaelle and the rest of those formerly employed at Joe Sitt's Dreamland amusement park at Coney Island will be counting something entirely different: their losses. The state Supreme Court has denied Raffaelle's plea to force Sitt to reopen Dreamland, thus sealing the beleaguered park's fate for the remainder of the 2009 season. On the bright side, some lucky ride operator will now have the opportunity to purchase the park's Dragon Wagon roller coaster, which came from Michael Jackson's Neverland Ranch, for a cool $95,000 on UsedRides.com. Butch Butler, the ride's owner, has decided to sell the coaster rather than attempt to truck it back to California. Amusing the Zillion has the full scoop. Technology continues to be an enthusiast's best friend as more and more parks begin to utilize it to offer real-time information to guests. Not to be left off the bandwagon, Funtown Splashtown USA has announced the release of their new "Funtown Splashtown USA Virtual Brochure" application for iPhone and iPod Touch devices. The application, which is available through the Apple iTunes App Store, can be used to access a park map as well as real-time information on everything from park hours to entertainment. In a very surprising announcement today, Disney has revealed that they have agreed to purchase Marvel Entertainment Inc. for $4 billion. The deal is expected to be complete by the end of the calendar year. 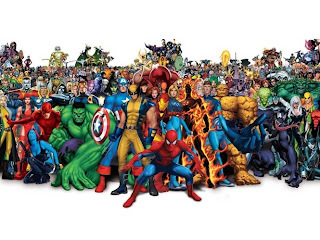 The acquisition gives Disney ownership of Marvel's portfilio of some 5,000 popular characters. It's an interesting fit for Disney, but I suppose at the very least it fills a 'teen boy' gap that the company has long had. As for what will happen with Universal's Islands of Adventure land themed solely on these characters, well, they seem safe. Apparently the licensing gives the park their use even with the new owner having their own World up the street. Universal has released a statement that the deal should not affect their park at all. Disney President Bob Iger has also been quoted saying that they will uphold the licensing contracts in place (rides, movies, etc.) until they expire. The Orlando Sentinel has a pretty good article with a slight focus on the parks, if you'd like to check that out. So what do you guys think, will we see a Marvel ride of some sort at the Disney Parks? The movie themed parks seem to be the best fit... I can't really see a Captain America dark ride in Fantasyland. Thoughts? It's been fun in a sad way to keep up with Geauga Lake's Wildwater Kingdom in Ohio since the demise of the classic amusement part after 2007. This year the water park added some new items to its line up - not rides mind you, but some new stuff. I found this photo gallery on flickr of shots recently taken at the park. You can see the area they created after tearing down the water ski stadium, and also the Little Tykes Town attraction. I thought the Little Tykes stuff would be custom for the park, but it looks like they literally just dropped down the normal play sets in some grass! Editor's Note: This post is the third in a three-part series covering NPN's recent visit to Idlewild & SoakZone. Be sure to check out Part 1 and Part 2 as well! In light of everything we've seen so far at Idlewild and SoakZone, there's really only one logical reaction to the sign above: DUH!! Our super sleuth investigation has already proven beyond a shadow of a doubt that this park is well deserving of all the praise it garners in the "family friendly" department. But you ain't seen nothin' yet. We have two areas left to explore, and both are prime examples of what makes Idlewild a quintessential children's park. If you want to succeed as a children's park, you've gotta know children. And if you want to know children, you've gotta do research! The folks at Idlewild are quite good at keeping a finger on the pulse of all things pint-sized, which is surely a contributing factor to the park's enduring success. So what's one thing they've learned through the years? Climbing, sliding, and crawling never go out of style. Welcome to Jumpin' Jungle, which can best be described as an oversized playground on crack. As I noted in one of my recent Idlewild brochure features, Jumpin' Jungle was the brainchild of Kennywood Entertainment. 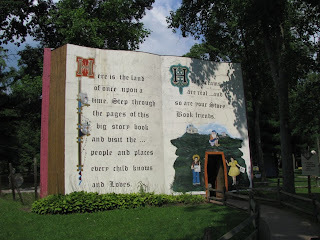 It was built in 1983 to help bridge the gap between Story Book Forest (spoiler alert!!) and the rest of Idlewild. Ed elaborated on the appeal of Jumpin' Jungle by telling us about a recent study conducted by the Children's Museum of Pittsburgh. In a survey of children where they were asked what they like to do most, the top three responses were climbing, getting wet, and getting dirty. Note that all of these are "hands on" activities! While none of us would debate the merit of all the wonderful mechanized rides that make their home at Idlewild, there's just something about good old fashioned playground equipment that lights a fire in kids' eyes. The other bonus? No waiting in line! The majority of the attractions in Jumpin' Jungle allow kids to come and go as they please. "That's why Jumpin' Jungle is still so successful," Ed told us. 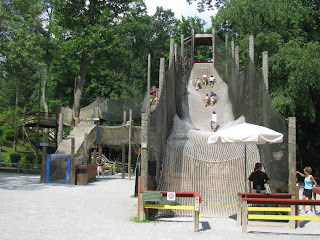 "Kids love the net climb and the ball crawl and all that stuff where they can just run loose." Is it just me, or does Idlewild's Bigfoot bear a striking resemblance to Captain Caveman? So what do you get when you cross one Children's Museum of Pittsburgh study with one alleged Bigfoot sighting in the general vicinity of Ligonier? Why, Bigfoot's Mudslide, of course! (And by the way, that's a bona fide Ed Saxton original.) I always enjoy hearing stories about how various rides got their names, and this one was no exception. Ed explained that it actually started out as a joke, but then it just kind of "stuck". Funny how that happens in life! But hunting down Sasquatch was not my number one priority on this particular trip. The end of our visit drew near, and I had yet to explore the very attraction whose construction I've been covering all through the off-season. At long last, there it was in all its glory: Safari Hut! Inspiration comes in all shapes and sizes, and often when you're least expecting it. Turns out this one came from Extreme Makeover: Home Edition! Idlewild's General Manager just happened to catch an episode a few years back where they put a structure like this in somebody's yard, and the rest is history. But wait, you say. What's so special about a treehouse with a couple of slides? I'll tell you, since you asked. Try this one on for size: That's a REAL Eucalyptus tree trunk! No joke! It was trucked the entire way across the country from California, and it has become quite the conversation piece in Jumpin' Jungle. As Ed told us, "You get the constant reaction where there's two guys standing here while their kids are on it, arguing over whether the tree is real or fake." But the real-versus-fake discussion should be put to rest relatively soon, as Idlewild is working on a sign to be placed next to Safari Hut which will detail its history. "It's real, and it's spectacular." We were speaking, of course, about the legendary Story Book Forest. This attraction, which celebrated its 50th anniversary in 2006, is a throwback to the many "storybook lands" which dotted the country in the '50s and '60s. Idlewild's was born of a shared dream between then owner C.C. Macdonald and longtime park entertainer Arthur Jennings, who wanted to create an attraction "based on emotion rather than motion". 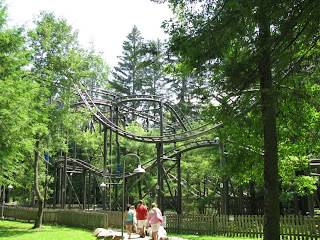 These days, few such attractions still exist, which makes Idlewild's all the more special. "We have one of the last remaining ones intact and it's still all original," Ed noted. A "live" Captain Candy minds his ship. Story Book Forest is a land of winding pathways along which you'll find life-size recreations of all your favorite nursery rhymes, from Humpty Dumpty to Jack and Jill. All of the buildings and statues were carefully crafted, and the result is a very lifelike experience. But imagine how much more lifelike it becomes when you realize that some of the statues are not statues at all, but real human beings! A smattering of "live" characters are always present in Story Book Forest. One of the most notable is Mother Goose, who has been played by Beverly Leonatti (General Manager Brandon Leonatti's mother) for well over a decade. She is a very sweet woman indeed! Of all the attractions at Idlewild, Story Book Forest is often the one that keeps patrons coming back well into their golden years. Ed told us they often see parents and grandparents proudly telling the younger generation that they had their photo taken at one spot or another in Story Book Forest. 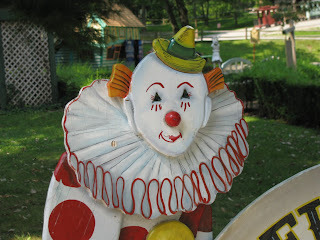 This character was crafted to resemble "Happy Dayze", the clown portrayed by Art Jennings for many years at Idlewild. I'll openly admit to you right here and now that Mike and I barely scratched the surface of Story Book Forest. And I mean barely. There is so much more to see than what appears in our precious few photos! But instead of viewing this as a downside, we view it as reason to return to Idlewild--soon! "Children's park" or not, we were impressed. And the multitudes of visitors who decide to return to this shady Ligonier refuge in adulthood is testament to its uniqueness. "We realize that we lose kids around the 8 to 10 range," Ed told us, noting that Idlewild's loss often translates into Kennywood's gain. (Hey, at least they stay in the family!) "But we hope we've made enough memories so that when they have kids, they come back again." For the record Ed, Mike and I graduated from that "8 to 10" range quite a few years ago, but you've still got us! Mike and I would like to sincerely thank Ed Saxton for all the hospitality he showed us during our visit to Idlewild and SoakZone. It made our trip all the more memorable! If you'd like to see even more of this unique not-so-small park, check out our public album on Facebook. 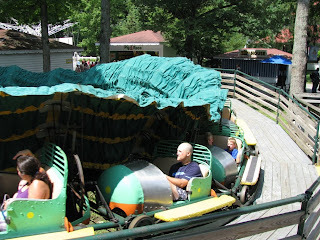 Next up in our coverage of NPN's fantastic western PA journey, Mike will take you to Kennywood! Being from Indiana, we are quite interested in the defunct amusement parks that were located in the Hoosier state. Many of these parks were located at the end of trolley or interurban lines and were built to promote usage of the lines on weekends. The railway built to the park was actually a street car line. On opening weekend, the street car had to run all night to accommodate the crowd. The street cars were open sided and so loaded down people were hanging on both sides of the car. Boyd Park opened for a full season on June 14 1902. 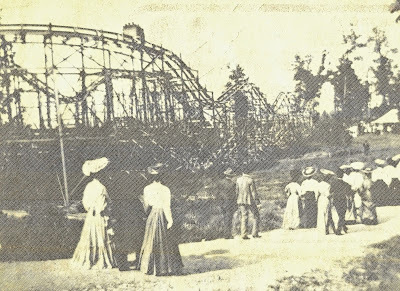 Located on West Cooper Road in Richvalley, along the Wabash River and covering 18 acres, Boyd Park featured the first roller coaster in Indiana. Originally called the Scenic Railway, it was a huge side friction woodie that wound it's way through the park. Other entertainment included Vaudeville acts, musical & traveling shows, a dance hall and a dock for boats. The park was special in many ways, for many it was the first place they ever saw an airplane. It's unsure if the plane was flown by the Wright Brothers, remember they weren't famous at that time, but there weren't many airplanes around in 1903. In 1904 Cleveland syndicate took over and consolidated the line with the Fort Wayne Southern Traction Company. The a true interurban line was built on the other side of the Wabash River. 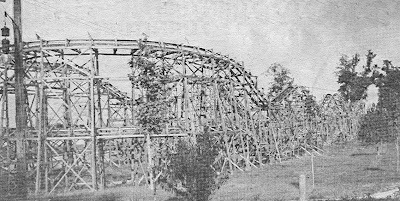 The other coaster was one of the first looping coasters, the Loop to Loop. Like most looping coasters of that time, it wasn't financially successful, more people watched than rode. The were also a variety of carnival rides, which were removed in 1908. It seems 1908 was the beginning of the end for Boyd Park. The park was being run by an outfit from Chicago, that brought in girlie show and other brazen things that shocked the locals. The reasoning for the wild entertainment was said to be that the Chicago group had the backing of other amusement parks and if the blue law went though they'd all have to close down. In other words this small Midwestern park was being used as a guinea pig. editors note: Blue laws restrict certain activities on Sunday such as girlie shows, selling alcohol. The Sentosa Theme Park blog has come through again with another great video filled with the latest shots of the currently under construction Universal Studios Singapore. 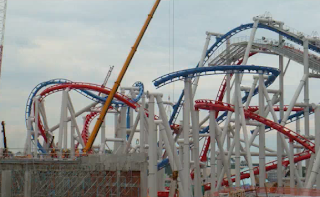 The Battlestar Galactica dueling roller coaster continues to move toward completion, and the ride's first elements in place. There are also shots of the coaster's trains on site, with some sneaky tarp-pulled-back shots of them as well! This ride is really one huge twisted mass of metal! The rather cool looking Jurassic Park river rapids ride is also moving along quickly, and I believe that it's now officially home to some dinosaurs. Click here to head to the Sentosa Theme Park blog and check it out. 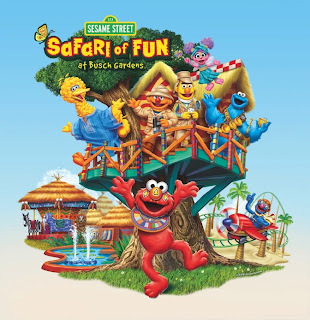 Busch Gardens Tampa has announced the Sesame Street Safari of Fun as their new for 2010 addition to the park. The new land will take over the present Land of the Dragons children's area, and will play host to the entire Sesame Street gang. Several existing attractions will be rethemed to fit into the new area, while new ones will also be added - effectively doubling the size of the current family friendly land. A new junior sized roller coaster, called Air Grover, will take passengers on a thrilling ride in Grover's plane over the Sahara. A new carousel called Elmo's Safari Go-Round will take riders on a spin atop their favorite jungle animals, and the Zoe-Patra & the Hippos of the Nile mini flume allows rider to journey down the famous river. Plenty of other attractions featuring the famous Sesame Street characters will delight all who visit, you can read more on Busch Garden's Tampa's official website. The park's 4-D theater will also feature the popular film "Sesame Street Presents Lights, Camera, Imagination!" as well. The new land is slated to open next Spring. Editor's Note: This post is the second in a three-part series covering NPN's recent visit to Idlewild and SoakZone. Be sure to check out Part 1 and Part 3 as well! Now that we've explored Raccoon Lagoon and Mr. Rogers' Neighborhood, it's time to trek back across the Loyalhanna Creek and rejoin the rest of Idlewild. It was a hot day, so naturally our thoughts (and our cameras) gravitated toward water. 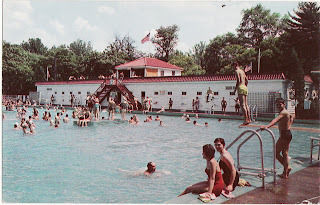 Pictured above is Idlewild's historic pool, which dates all the way back to 1932. Okay, okay: You got me. Neither Mike nor I took that photo! (What was your first clue?) I actually don't have a date for this postcard. But if I were a betting woman, I'd say this photo was probably taken sometime between 1932 and 2009. Idlewild's water attraction complex has an interesting history. 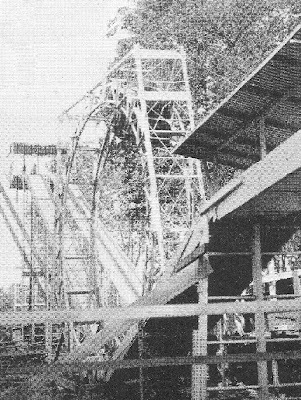 During Idlewild's earliest days as an amusement resort, three man-made lakes were dug on park grounds. The last of these was Lake Bouquet, which came into existence in 1896. Patrons were drawn to Lake Bouquet for its fishing and boating as well as the scenic beauty of Flower Island, which was located at its center. It was on this island that Idlewild's swimming pool was added. My gosh does that look refreshing. Maybe if I just dip my feet...You don't think my sneakers would mind, do you? The pool enjoyed relative solitude on Flower Island for a good half century before it was joined by Idlewild's first water slides in 1985. The park had just been purchased by Kennywood Park Corporation a couple years before, and the new owners decided to capitalize on the water park craze that was sweeping the nation. The new slide complex was dubbed "H2Ohhhh Zone". As you can see in the photo above, two of the original four slides have since been removed. Maybe if I just dip my whole body...You don't think my new camera would mind, do you?? The following year, two additional slides were added which emptied directly into the pool. [And by the way, I will take credit for this photo!] From the looks of this crowd, I think it's safe to say that the popularity of Idlewild's original water attraction has not diminished over time. Alright, now this is just cruel and unusual punishment. Have I mentioned that it was HOT the day of our visit??? Enter the year 2000. By this point, H2Ohhhh Zone's crowds had expanded well beyond its means. 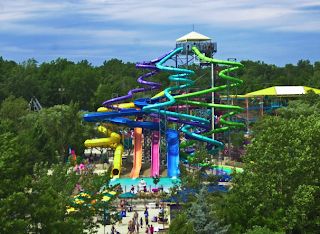 Idlewild's owners responded by unveiling SoakZone, the park's largest expansion to date. The new and improved water complex was double the size of the former H2Ohhhh Zone and opened with a whole host of new slides and attractions. The only "loser" in this expansion was Lake Bouquet, which was partially filled in to accommodate the new area. The most recent addition to SoakZone was Captain Kidd's Adventure Galley, a large water play structure which was added in 2006. While it's impossible to miss this massive tangle of colorful slides, sprayers, and jets, I must say it's taken the place of Rafter's Run in the isolation department! (Refer to the map in Part 1.) Given the placement of Captain Kidd, I can't help but wonder if SoakZone is poised to overflow its boundaries once more. Speaking of being off the beaten path, that's the strangest looking water slide I've ever seen! It's also our cue to bid farewell to the refreshing waters of SoakZone (in which, sadly, we did not partake) and move on to Olde Idlewild. If it's rides that you crave, welcome to the holy land of Ligonier. Olde Idlewild houses the great majority of the park's "big" rides, many of which are quite historic. Give us a brake, man! Our first specimen is a classic in every sense of the word, from its age right down to its manual brakes. 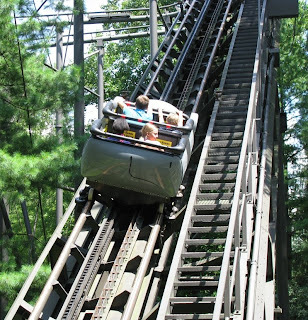 Built in 1938 by the Philadelphia Toboggan Company, Rollo Coaster is one of the last of a dying breed of coasters which have no seat dividers and no restraints to speak of. And as far as the ride itself is concerned, there's no denying that this coaster is one of a kind...although it has been cited as a source of inspiration! "A lot of coaster enthusiasts come here and swear that it was the inspiration for Boulder Dash," Ed told us. Though I've never ridden Boulder Dash (for shame! ), I can definitely see how one would draw that comparison. Rollo Coaster's 900 feet of track are laid out along a heavily wooded hillside, forming an out-and-back course that whisks riders through Idlewild's signature vegetation. Would Rollo Coaster wow the most ardent of thrillseekers? Probably not. But that's not who it was built for, and it's certainly not what Idlewild is all about. As Ed pointed out, when it comes to parks, it's just as important to know who you're not as it is to know who you are. "It's always been our plan to be a family friendly park," he told us. "We always ask ourselves before we do anything, is this going to be okay for kids and adults? You would never see us add a coaster like the one Kennywood's adding. None of our patrons would want to ride something like that. That's not who we are." The golden rule here is that one enthusiast's "kiddie" coaster is an actual kiddie's treasure. Rollo Coaster delivers more than enough thrills to satisfy the majority of Idlewild's pint-sized guests--not to mention a couple of not so pint-sized bloggers! And to help us all commemorate our experience, the park has equipped the coaster with on-ride photo capabilities for the 2009 season. Speaking of knowing who you are, you need look no further than Olde Idlewild to understand that this park's dedication to preservation extends well beyond trees. 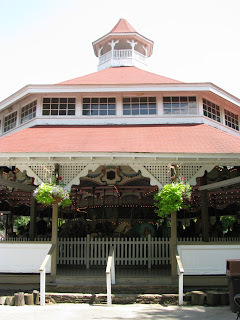 The Carousel is another classic.ride that has been standing proud at Idlewild since 1931. It still features the original hand-carved wooden horses, and underwent a complete restoration in 1985. "It's always been our goal to maintain that classic amusement feel," Ed told us. 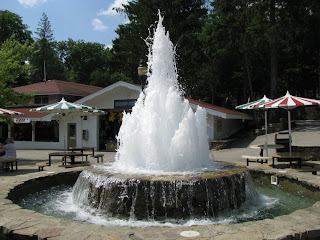 "From day one, even before Kennywood took over, this was a classic park. And when Kennywood came in, I think they saw that niche right away." 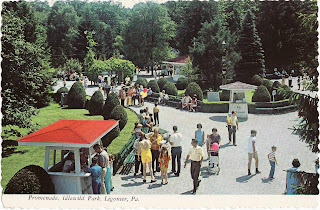 It truly is remarkable--and quite fortunate--that a classic park such as Idlewild would ultimately end up in the very capable hands of Kennywood Entertainment. As you'll see in our upcoming Kennywood trip report, those folks knew a thing or two about operating a traditional park. Ed noted that Idlewild learned more from Kennywood than they probably could have learned from any other owner. And despite the recent changing of the guard, he is quite confident that the park's newest owners are also on board with their mission. So in Idlewild's case, thankfully, the more things change, the more they stay the same! It may not be as old as the Carousel or Rollo Coaster, but the Caterpillar is arguably the most historically notable of all Idlewild's rides. Decades ago, nearly every park had a Caterpillar. But today, only a handful still exist and even fewer have a working canopy. Idlewild's Caterpillar has all that and then some--and that "some" is a fan. Yes, a fan! Though I didn't realize its significance at the time, this installation has a fan beneath its track at one point that blows a jet of air into each car as it passes overhead. For some reason this struck me as hilarious, perhaps because it reminded me of an old funhouse stunt. So naturally, I laughed hysterically every time we hit it! [It doesn't take much. Seriously.] In any event, upon returning home I've come to learn that only the rarest of these rare Caterpillars still have a working fan. This ride is a gem indeed. And the fact that it was built by Traver Engineering makes it even more special in my book. Idlewild's Caterpillar was the first of many Traver goodies we would experience on our trip, and each one was good to the last cycle! There be a rodent loose among those trees, and he does not mess around! In addition to all of its historic rides, Idlewild has yet another claim to fame: It is the home of the only Wild Mouse coaster ever built by Vekoma. This small but punchy coaster began its life at Wiener Prater in Austria before being moved to Alton Towers and eventually ending up at Idlewild in 1993. After riding countless "canned" Wild Mouse models at other parks, this one was a very nice change of pace. Sure, it has all the standard hairpin turns and sharp drops that you'll find on any mouse. But the layout is a bit more interesting, and once you throw in all those trees, it gets even more interesting! Confusion Hill or lift hill? To conclude Part 2, I'll leave you with another gorgeous yet undated image of the Olde Idlewild of...old? Why, it hasn't changed one bit! And in this case, I mean that as the highest of compliments. When we meet again, we'll wrap up our adventures in Ligonier!